SOLAR-X reflective laminated auto glass is a proprietary product developed by National Glass Brokers. It is based on innovative coating technology that applies a special coating onto the glass surface, which can effectively reduce solar radiation. This innovative product has successfully captured the domestic market. 1).The Solar X reflective laminated auto glass can reduce more than 66% solar heat radiation, thereby reducing solar heat gain, which in turn reduces loading on air conditioning and fuel consumption. 2).It can block out 99.9% UV radiation, protect the textile fabric in vehicles from fading and changing colors, reduce the sense of burning heat on the skins of drivers and passengers and enhance the comfort of car passengers. 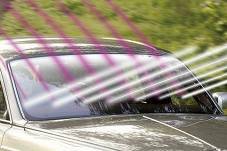 3).With over 70% visible light transmission (and over 75% for products export to Europe) the reflective laminated auto glass allows drivers with an open and clear vision for safe and comfortable driving. © 2019. National Glass Brokers All rights reserved. 1.) The Solar X reflective laminated auto glass can reduce more than 66% solar heat radiation, thereby reducing solar heat gain, which in turn reduces loading on air conditioning and fuel consumption. 2.) It can block out 99.9% UV radiation, protect the textile fabric in vehicles from fading and changing colors, reduce the sense of burning heat on the skins of drivers and passengers and enhance the comfort of car passengers. 3.) With over 70% visible light transmission (and over 75% for products export to Europe) the reflective laminated auto glass allows drivers with an open and clear vision for safe and comfortable driving.